Keynote for Mac is a great app for conference presentation. No doubt, you can kill people with Keynote as much as you can with Powerpoint or Prezi. But if you know what you are doing, Keynote allows you create slick looking presentations that wow your audience away. The only problem is: Most conference rooms run on windows… bummer! “Nevermind,” you might think, “I will just export the file to PPT.” Good thinking, but unfortunately something always goes wrong in these exports. Picture frames are off, transparent backgrounds become white, and these awesome “Magical Move” transitions disappear. No, my friend, Powerpoint cannot handle Keynote presentations – at least it cannot handle mine. “So, I just hook up my own computer!” Great idea, but this is not always possible. Maybe you are in the middle of a session and the other presenters are using Windows, or maybe your presentation is recorded for a live feed to an overflow room or for putting it on the web. Switching laptops often kills that feed. At the very least, switching laptops can be risky, and it takes away precious presentation time. “How else can I present my Keynote talk on a Windows PC then,” you shout out in despair! The solution is simple: Quicktime it. The great thing about Quicktime export is that it will make a movie of your presentation that looks exactly the same as if you ran your Keynote on your own Mac. Fonts will be the same, animations will be the same, everything will be the same. 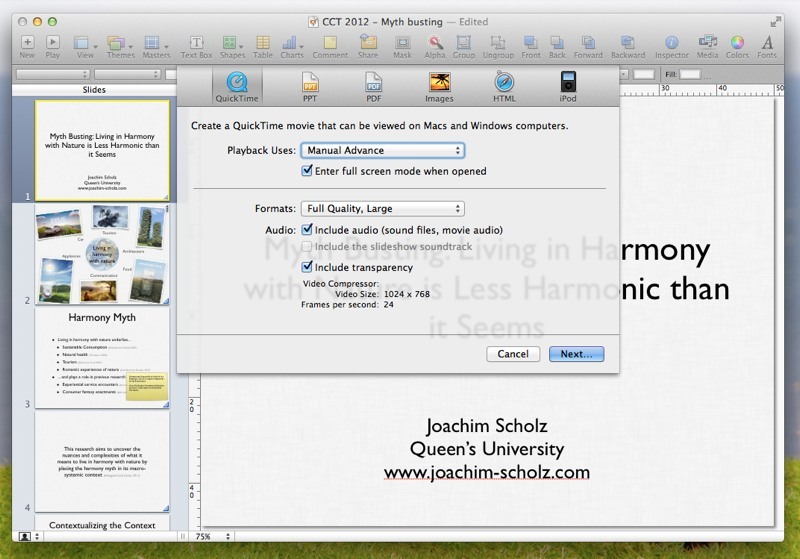 Think about Quicktime as the PDF format for presentations. The PDF analogy is not only true because the end result, your presentation, will look the same on a completely different computer, but also because pretty much every computer, including all Windows PCs I have ever touched, comes with the Quicktime player installed. To export your masterpiece presentation to Quicktime, simply open up the export dialogue via File > Export… and choose Quicktime in the header. The picture below shows you my preferred settings. 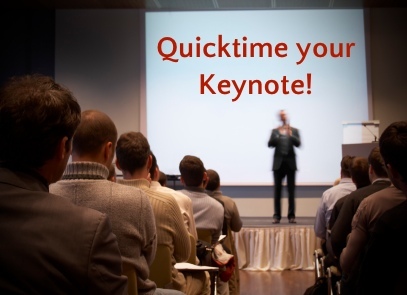 Quicktime is for presentations what PDF is for documents. Just make sure you select Manual Advance to make sure you can click through the stages of your talk like you are used to from Keynote and Powerpoint. The probably most important thing is to choose Manual Advance as the playback mode. With this setting, your Quicktime presentation works pretty much the same way as a normal Keynote or Powerpoint presentation. The only difference is that you won’t be able to the presenters note in the secondary screen, but hey: If you need this, you didn’t practice enough anyways! Exporting to Quicktime takes a little time, and the resulting file is rather large, so don’t leave this until the last minute before your talk. Also, it is of course always worth checking the end result. In one of my rather graphic intense keynote presentations, the Quicktime export once swallowed some text. I don’t know why, but I ran the export a couple of times, and eventually I got the whole presentation exported without any errors. The progress windows shows how the keynote is running through (don’t worry, the end result will look much smoother), so keep an eye on it while exporting. Yes, it really does work. I have just done this on the wonderful, absolutely amazing Consumer Culture Theory conference in Oxford (thanks to all who dropped by!). The presentation ran through smoothly, and everything looked exactly the way as it was supposed to be looking. This is how my Keynote looked like after exporting it to Powerpoint. Not cool! The Quicktime export is much more reliable than using Powerpoint. The only thing you have to look out for when starting your presentation is that the computer uses the Quicktime Player for the file. Some computers associate different apps for the *.mov file, and these other apps (e.g., Windows Movie Player) might just play your presentation as a movie, ignoring your click commands. No worries! Just right click on the presentation file and choose Quicktime Player in the “Open with…” dialogue. So how does such a Quicktime talk look like? I will put up my resent CCT talk on my research blog as soon as I revamped my research page, so you can see a Quicktime presentation for yourself. 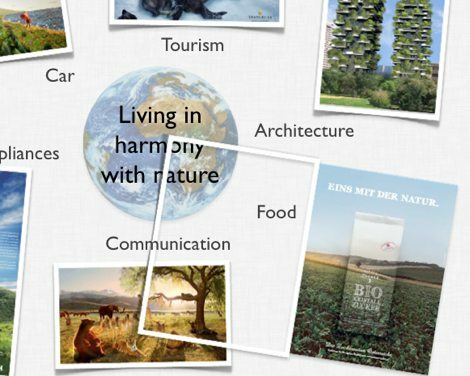 If you are interested in how contemporary advertisements discursively create a myth of living in harmony with nature by using style elements of Romantic landscape paintings, write me an email (see Contact at the bottom of this page) and I will send you the presentation via dropbox. Do you know if there are any video players for iPad which would be able to deal with these manual advance movies? I hate working on a presentation on my Mac and then losing a lot of stuff when moving to Keynote on iPad.